FREE DELIVERY ON ORDERS OVER £50 TO UK MAINLAND! Light sky blue glass paint. Rising high above the Blackdown countryside the pretty Skylark flies through the blue sky to land lightly on the Thorndown colour chart. Pastel blue with a chalky grey undertone. Thorndown’s revolutionary water-based Skylark Blue Peelable Glass Paint is made from a resin using 100% recycled plastics. Paint it on - Peel it off! A strong berry blue wood paint. High performing exterior and interior eco wood paint with minimal V.O.C.s. Just like the native wild berries found in the Somerset countryside, this fruity blue has a warm rich depth to it. This Bilberry Blue Wood Paint is suitable for any application inside or outside. A light grey - blue wood paint. This name pays homage to Greylake, a Site of Special Scientific Interest on the Somerset Levels looked after by the RSPB. Just like the water on the reserve, this paint colour is a deep reflective pool of light grey blue. This Greylake Wood Paint is suitable for any application inside or outside. A sophisticated and charming dark blue inspired by our Bishop of Bath and Wells. Traditional dark blue with charcoal grey undertone that will smarten up whatever it is applied to. This Bishop Blue Wood Paint is suitable for any application inside or outside. Dark grey teal wood paint with blue and a touch of green. High performing exterior and interior eco wood paint with minimal V.O.C.s. Dark grey teal colour, drawn from the deep cave pools of Wookey Hole and the countless underground cave systems lying underneath the Mendips. This Cavepool Grey Wood Paint is suitable for any application inside or outside. Light sky blue wood paint. Rising high above the Blackdown countryside the pretty Skylark flies through the blue sky to land lightly on the Thorndown colour chart. Pastel blue with a chalky grey undertone. This Skylark Wood Paint is suitable for any application inside or outside. A translucent blue glass paint. Thorndown’s revolutionary water-based Elf Blue Peelable Glass Paint is made from a resin using 100% recycled plastics. It is non-toxic, virtually V.O.C. free (Volatile Organic Compounds 0.05%) and halogen free with a low carbon foot print. Paint it on - Peel it off! A light bright blue glass paint. This beautiful blue is named after the Adonis butterfly that can be found in parts of the Mendip area. You are unlikely to find a more handsome blue. Thorndown’s revolutionary water-based Adonis Blue Peelable Glass Paint is made from a resin using 100% recycled plastics. Paint it on - Peel it off! Dark blue glass paint. A sophisticated and charming dark blue inspired by our Bishop of Bath and Wells. Traditional dark blue with charcoal grey undertone that will smarten up whatever it is applied to. Thorndown’s revolutionary water-based Bishop Blue Blue Peelable Glass Paint is made from a resin using 100% recycled plastics. Paint it on - Peel it off! A light bright blue wood paint. This beautiful blue is named after the Adonis butterfly that can be found in parts of the Mendip area. You are unlikely to find a more handsome blue. This Adonis Blue Wood Paint is suitable for any application inside or outside. Blue wood paint with a faint touch of purple. One of the most incredible birds of prey, the peregrine swoops through the sky guarding his countryside kingdom. A dusky blue with a hint of purple is named after this amazing creature. 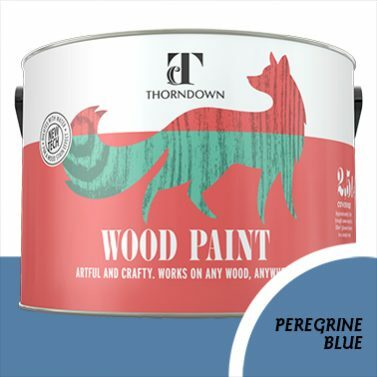 This Peregrine Blue Wood Paint is suitable for any application inside or outside. Aqua. A pool-like aqua green/blue wood paint. We may not have found any real goblins lurking in the Mendips but we do have Goblin Coombe, another amazing gorge in Somerset that is the playground of climbers, walkers and countryside creatures. This Goblin Blue Wood Paint is suitable for any application inside or outside. Subscribe to our Mailing List for all our latest updates, tips, tricks and advice for your next project.